The LymphoSite | Immunology, demystified. But most of the people who got the disease were vaccinated for it! I’ve moved to the domain thelymphosite.com – find today’s post linked below. But most of the people who got the disease were vaccinated for it!. A new study has come out from the UK, assessing the case for the National Health Service adding an adolescent booster of the pertussis vaccine to the schedule. I’m sure many of us in countries such as Australia, New Zealand, US and some European countries may be surprised to hear that this routine (to us) shot is not on the NHS schedule, but they did pioneer an advanced infant schedule which saw increased protection from pertussis in this age group. As you can see from the figure below, introduction of 2, 3 and 4-month pertussis shots onto the UK schedule in 1990 was followed by an absolute decrease in infant pertussis cases in the < 3 mo, 3-5 mo and 6-11 mo age groups (top graph), and following this change in the schedule, the < 3 month age group went from representing under 15% of cases in infants to 40-50% of these cases. 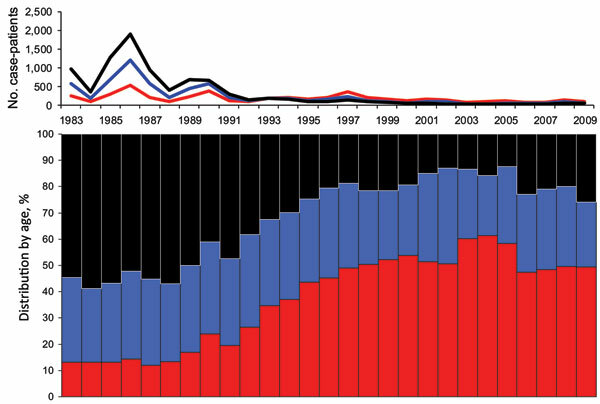 Age-group distribution of case-patients <12 months of age in pertussis case-notification reports, (Top) by total case patients and (Bottom) by proportion of age, England and Wales, 1983-2009. Red, < 3 months of age; Blue; 3-5 months of age; Black, 6-11 months of age. Source. However, as well as this clear evidence of effectiveness in the young, this earlier study also found pertussis to still be maintained in the adolescent and adult populations, where pertussis vaccine coverage is poor. As I’ve discussed before, duration of protection from the currently used acellular pertussis (aP) vaccine is estimated to last from four to twelve years, with recent result indicating the evolution of the bacterium may be contributing to early waning of immunity. While some countries have controlled pertussis in the adolescent cohort with later booster doses, the UK health authorities are currently considering adding such a booster to their schedule. The increased risk of pertussis infection in children who received pertussis immunisation over seven years ago is consistent with previous findings that immunity wanes over this time period, to the extent that non-recent vaccinees are at similar risk of catching the disease to unvaccinated controls. Keep in mind that this study only included immunised children, so there is no quantification of absolute risk relative to the unimmunised, though, as discussed above, that absolute protection has been demonstrated. That said, these results do answer the researchers’ question of how risk of pertussis increases with time in this age cohort not covered by a booster shot. The authors also assessed the number of times six patients coughed in a 24 hour period. Two coughed around 200 times, three around 500 times and one 1600 times, and on the basis of this the authors reinforce that, despite the established protection of recent vaccine-recipients from more severe pertussis disease, the once aP vaccinated can still suffer relatively severe symptoms on eventual infection. This is not the first time the authors have reinforced in a paper the importance of pediatricians considering pertussis as a potential diagnosis in cases of persistent cough, and hopefully it gets this point across to pediatricians who keep track of the literature. While it’s quite clear that the anti-immunisation lobby is going to jump all over selective quotations of this paper as evidence the pertussis vaccine is useless, in actuality these results indicate less pertussis infections in this age group since the introduction of the preschool booster (about half of the previous rate, despite over a third of this study occurring during a pertussis epidemic), and that the preschool booster has pushed back the time of immunity waning by several more years. The risk of pertussis was more than three times higher (21/53; 40% (26% to 54%)) in children who had received the preschool pertussis booster vaccination at least seven years before presenting with cough compared with those given the booster less than seven years previously (20/171; 12% (7% to 17%)). With such a severe mis-reporting of the study’s results, it’s only a matter of time until the anti-immunisation lobby, which regularly repeat the lie that vaccines increase your susceptibility to the disease and who never bother to follow up on news reports to see whether their claims are backed by the primary sources, touts this article as evidence of its claims. Oh wait, it’s already happening. Screenshot from the official twitter page of the Anti-Vaccine lobby group, the Australian Vaccination Sceptics Network. Screenshot from the Australian Vaccination Sceptics Network twitter page. As you can see the, this anti-vax group have quoted verbatim Medical Observer‘s headline: “Pertussis found in 20pct of vaccinated children“. Great choice of wording there, MO. Update: As of “3.34pm 26 June 2014“, Medical Observer have ammended their article to correct the highlighted error, but have maintained the misleading click-bait headline “Pertussis found in one fifth of vaccinated children“. On the 25th of May 2014, the spokesperson for the Australian Vaccination Skeptics Network (AVSN, formerly the Australian Vaccination Network), Meryl Dorey presented a talk, Vaccinations – Do They Really Save Lives? at the Healthy Lifestyle (You Can Heal Yourself) Expo in Caloundra, Queensland. If you’re familiar with the AVSN, you know they’re an anti-vaccine group that do not provide reliable information on vaccines, and in fact disseminate misleading, misrepresented and incorrect information about vaccination which engenders fear and alarm, according to the public statement the New South Wales Health Care Complaints Commission put out about them. You may have heard of their spokesperson and public officer, Meryl Dorey, who has no qualifications in immunology, microbiology, medicine or vaccinology and who for over a decade has been the major voice behind most of the incorrect information put out by the group. This talk was no exception. In reading the transcript there were three particularly egregious sections that showed a complete ignorance of immunology, and I must admit to enjoying falling down the rabbit hole of reading the broader history behind all three of them. So without further ado, Meryl Dorey’s own words, followed, of course, by referenced descriptions of the evidence around the claims. Meryl Dorey: “Um, the peanuts, peanut oil we believe has been included in vaccines since the late 1960s. I am 56 years old, I was born in 1958. I never knew anyone with peanut allergies until I started having my own children. So for a long time, 30 years, I never knew about peanut allergies, now you don’t know anyone who doesn’t have them. And um, there’s an excellent book that I can recommend called “The Peanut Allergy Epidemic”, Heather Fraser I think is the name of the author, and she discusses it. Um they have evidence that peanut oil is used as a carrier in many vaccines and to this day it’s used in many vaccines. And because, probably too long to go into, but because vaccines are intended to alert your immune system to the fact that there is an invader in there, and if you attach a peanut oil, let’s say, or an oil, a lipid of some kind to uh, a virus or a bacteria and then you inject it into the body, the body can look at that and say, okay I see measles and I know that measles is an enemy – this is the theory and I don’t know if it’s true but this is the theory – I know that measles is an enemy and attached to that measles I’ve got this weird oil. Now I’ve got something in my body that looks just like that, uh, I have all of this myelin wrapping around my nerves, and other oils that my brain uses, so I’m going to attack this because it’s attached to measles and when I see this oil in something else, in something that I eat or in my body I’m going to attack that too. So I’m going to develop a peanut allergy, I’m going to develop anaphylaxis and I can die after peanuts. The claim that peanut oil has been included in vaccines since the sixties is downright false, with peanut oil not in any vaccinations on the Australian or American schedules. Only on anti-vaccines sites is this claim made. In lieu of any proof that vaccines currently contain peanut oil, the authors of those pages point to studies performed with experimental vaccines containing peanut oil based adjuvants, most citing papers detailing the development and eventual abandonment of ‘adjuvant 65-4’. As with any water-in-oil emulsion-based adjuvant, vaccine antigen was made up in water and an emulsifier used to suspend it in oil. However, unlike mineral oils which the body has difficulty clearing (and as such are not licensed for use in human adjuvants), the use of peanut oil in adjuvant 65-4 meant the oil was completely metabolisable. Contemporary studies showed a positive safety profile and duration of immunity in humans and animals for an experimental adjuvant 65-4-containing influenza vaccine, leading to a United Kingdom licence in 1973. However, the US requirement that the oil mannide monooleate be used instead led to reduced efficacy and saw the eventual abandonment of the entire adjuvant 65-4 vaccine project. Similarly, sesame oil has been used experimentally in emulsion–based adjuvants. The entirety of the evidence for the claim of peanut and sesame oils being in modern vaccines, as found on anti-vaccine sites, consists of links to early studies and reviews of peanut- and sesame-oil adjuvants, cited as somehow being proof they are included in current vaccines. In reality, the only emulsion-based adjuvants licensed for use in humans use the oil squalene. A common trope to try and worm around this lack of evidence, used by many American-based anti-vax sites, is to say that because peanut oil is classified ‘generally regarded as safe’ (GRAS) by the United States Food and Drug Administration it does not need to be mentioned in the labelling of vaccines. However, a complete list of substances involved in vaccine production reveals that no peanut products are used at any stage of the process. So Ms Dorey’s claim is presented not only without evidence but on investigation is found to be baseless, though oft-repeated in online anti-vaccine conspiracy websites. But what about this part? Ms Dorey goes on to tell the questioner that the immune response generated against peanut oil in vaccines cross-reacts with myelin in the brain. While molecular mimicry – the phenomenon of an immune response against one molecule leading to an immune response against another similar molecule – is considered as a viable hypothesis for the development of demyelinating diseases, a literature search for the terms ‘peanut myelin’ fails to turn up any research demonstrating co-occurrence of peanut allergies with demyeinating disease, or any molecular evidence of immunological cross-reaction between antigens from either of these sources. Not only are peanut products not used in vaccine production, but there does not appear to be any evidence linking peanut allergies to demyelinating diseases as Ms Dorey claims. The next excerpt contains a claim Ms Dorey has been making for a while now. This is a claim Ms Dorey has made before, specifically that vaccines are designed primarily to get B cells to produce antibodies against vaccine antigen, but because there exists another arm of the adaptive immune system (T cells, the cellular mediators behind Merrill Chase’s observations), and because antibodies are not an absolute marker of protection, vaccines therefore induce ineffectual protection. First off, it must be pointed out, T cell responses induced by vaccines on the schedule have been researched and characterised. However, what is particularly humourous about this claim is that knowledge of T and B cell interactions has actually been incorporated into vaccine design since even before the AVSN was founded. The conjugate Haemophilus influenzae type B vaccine, licensed in the United States since 1987, includes a protein carrier specifically chosen for its ability to stimulate T cells, to take advantage of the improved immune response that occurs when cell-mediated immunity and B cells cooperate. As for Ms Dorey’s claim that antibodies are no indication of whether you’re going to be protected at all, specific antibodies induced by vaccination are a quite effective indicator of the level of protection afforded to vaccine recipients. Decades of work show that by observing levels of antibody induced by vaccination and correlating it to disease outcome, it is possible to define a threshold of induced antibody above which an individual is at drastically reduced odds of developing disease on subsequent exposure. However, reduced risk of disease with high levels of antibody is not the same as no risk; the fact of the matter is that high levels of specific antibody correlate with a lower chance of catching disease, and better clinical outcome in those ‘breakthrough’ infections. However, the fact that small proportions of people may come down with disease despite being above an experimentally determined threshold does make Ms Dorey’s comment, “So the whole purpose of vaccination is to create these antibodies, to cause our bodies to create these antibodies, and yet that doesn’t mean that we’re going to be protected at all” technically true, if used entirely deceptively. It’s worth pointing out that Ms Dorey’s dismissal of this work is not limited to rejecting the existence of an antibody-prognosis correlation simply because it is not absolute (the Nirvana logical fallacy), in fact she denies any immunological role for antibodies, outright describing them as “Peripheral to protection”, showing ignorance of decades of research that demonstrates protection mediated by direct transfer of antibodies, transfer of antibodies through breastfeeding and more recent highly specific mAb therapies. A review which describes in detail the protective levels of antibodies induced by vaccines, the evidence of antibodies as direct mediators of immunological protection and which, when it comes to the discussion of T cell responses, describes as “obvious” that “antibodies in sufficient quantity are the predominant protective correlate“. A textbook chapter, which describes the importance of antibodies in mediating protection and paints a picture of T cell aspects of the response as primarily supporting antibody production. A research paper in which mice whose B cells were unable to secrete antibody succumbed to an infection that wild-type mice survived (the authors go on to describe this antibody mediated protection as “critical” to surviving the infection) – an observation entirely incompatible with the antibodies being “peripheral to protection”. Ms Dorey cites each of these as a source and yet continues to spread counter-factual information that they each refute, making it impossible to attribute this campaign of misinformation to mere ignorance. It seems Ms Dorey is either sufficiently scientifically illiterate to not realise the papers she cites for support are incompatible with her contentions, or she is deliberately deceiving the public about the efficacy of vaccines and basic cellular and molecular functions of the immune system. 2 – That a major cellular mechanism by which protection through immunological memory is maintained is pure fiction, despite over a century of research demonstrating its reality. Such egregious misinforming of the public simply does not constitute appropriate behaviour for a health care provider. Meryl Dorey tells this questioner that a black-market trade of foetuses aborted from mothers infected with vaccine-preventable diseases exists, to supply the raw materials for making more vaccines against those diseases. Further, foetuses are just not required for the ongoing production of vaccines. In the 1960s two cell strains (WI-38 and MRC-5) were derived from legally medically-aborted foetuses. These cell strains simply need to be given the right conditions to survive and replicate; the progeny of those cells isolated in the ’60s are still used and dividing today in laboratories around the world. Because viruses need to infect living cells to replicate, the viral components of Hepatitis A, Rubella, Varicella, Adenovirus and Rabies virus vaccines are grown in those two cell strains. Vaccine production just does not need a periodic top-up of fresh fetuses as Ms Dorey says is provided by her fictional fetus-trade. The cell strains were not chosen to grow these viruses because the mother was infected with them (firstly, there are two strains and five viral species cultured in them), they were chosen simply because they supported growth of those viruses. The mothers’ infection history and whatever antibodies they were passing on to their fetuses are entirely irrelevant to this. The presence of antibodies against the virus in question should be expected to be a hindrance to their culture, and could be expected to interfere with the action of the vaccine should they make it into the final product. Ms Dorey’s talk shows ignorance of some basic concepts in immunology (such as what antibodies are, and a role of T-B cell interactions which has been incorporated into vaccine design longer than the AVSN has existed) and vaccine production (featuring a description of virus culture so fantastical it breaks Australian law). What is worse, Ms Dorey’s previous use of references that so neatly contradict so many of these claims makes it very difficult to believe these are simple naive mistakes. No group that so radically and deliberately misinforms the public deserves the official status of healthcare provider that the Australian Vaccination Skeptics Network has. We have all heard the mantra: prevention is the best cure. When it comes to medicine and medical research this is very much true. And it is not vexing why. This post is a discussion of the April 2014 study showing Australian pertussis bacteria to be losing expression of the vaccine target pertactin. The post describing the evidence that the pertussis vaccine does not increase susceptibility to parapertussis is here. Finally, more information has come out about the proportion of Whooping Cough bacteria that are losing expression of a protein targeted by the current vaccine. The background it relatively simple: from the 1950s a vaccine against whooping cough was used that contained whole, killed cells of the bacterium responsible for the disease, Bordetella pertussis. Although the biggest studies to date have failed to support the claims, contemporary fear–mongering led to an increase in rejection of the vaccine and in lawsuits filed against its manufacturers and a subsequent shortage of the shot. Part of the solution to the drop in public confidence was the development of a vaccine that only contained several key proteins of the pertussis bacterium, the acellular pertussis (‘aP’) vaccines. In Australia, the whole cell vaccine was fully phased out of routine childhood immunisations in the early 2000s, with an aP shot containing three pertussis proteins currently on the childhood schedule. Last year, an American report noted that of 12 clinical isolates (that is, samples of the bacterium obtained from sick patients) of Bordetella pertussis they tested, 11 had lost expression of Pertactin (Prn), one of the proteins included in modern formulations of the aP shot. Given that the version of the shot subsidised for the childhood schedule only includes three pertussis proteins, one of which is Prn, there is the possibility that this loss, if widespread, may have serious implications for the effectiveness of the immunity induced by the vaccine. As I predicted in my coverage of that paper, Australian researchers have since addressed the questions of how frequent these Prn-negative strains are and how recently they’ve arisen. In this post I will try to summarise for non-biologists the April 2014 paper, Rapid Increase in Pertactin-deficient Bordetella pertussis Isolates, Australia. The juicy bits of the paper are summarised in their Figure 2 (below) which shows how many isolates from each year did or did not have detectable Prn expression (the bars) and what percentage overall were negative (the line). The authors report only being able to detect Prn-negative strains from 2008 onward, with a sharp rise that culminates in ~80% of isolates lacking detectable Prn protein in 2012. This suggests that there may be a selective advantage for Prn-negative strains of B. pertussis. In order to determine whether this was a single chance event which gave one strain superiority, or possibly a more widespread loss of Prn protein expression in the wild B. pertussis population, the researchers decided to sequence the gene that normally encodes for Prn protein to see why it had been lost. Interestingly, the team discovered that there were multiple reasons for the block in protein production. 80% of Prn-negative isolates had insertion sequences – pieces of mobile DNA, sort of like mini-viruses that jump through the genome – smack bang in the middle of the gene, stopping production of the protein. Two of the 96 Prn-negative isolates seemed to have complete deletion of the gene. Sixteen of them had completely normal Prn genes, indicating some other factor regulating production of the protein must have been altered. All of these mechanisms again differed from those reported by researchers outside of Australia who reported Prn-negative pertussis isolates. In short, there have been multiple roads to Prn-protein negativity taken by the pertussis bacteria, which suggests there has been a strong selective pressure on it for so many ways of losing the protein to have spontaneously arisen in the B. pertussis population. So what does pertactin loss mean? From the vaccine effectiveness standpoint, if we assume near-complete loss of Prn expression, then our most-used vaccine now effectively only targets two pertussis proteins, PtxA (the active subunit of the pertussis toxin) and Fha (filamentous haemagglutinin – used by the bacterium to stick to things, such as our respiratory tract). As I described last time, the biggest prospective, randomised, placebo-controlled clinical trials of aP vaccines that only target these two proteins showed an effectiveness of 59-69% which equates to a 2.4-3.2 greater rate of pertussis disease in the unvaccinated controls compared to those who got the shot. While these figures are indeed suboptimal when compared to many other vaccines on the childhood schedule, it shows that targeting PtxA and Fha alone can mediate protection from pertussis. What about the effect of Prn protein loss on the bacterium? Well, the authors point out previous work that found Prn-mutants were less able to colonise mouse respiratory tracts, but those that managed to colonise were more able to invade the cells lining the tract and persisted for longer. The authors also point out work that found Prn-deficient mutants grew faster in the lab than the Prn-expressing bacteria they were derived from, but it’s unclear whether that has any relevance to an infection scenario – the fewer other proteins the bug has to produce the more resources it can dedicate to reproducing, but the loss of a protein that helps colonisation may not be worth it in an infection. In summary, Australian Bordetella pertussis bacteria are increasingly losing expression of pertactin protein. This apparently global trend by the species, with multiple mechanisms of loss (and even by the closely related species Bordetella parapertussis), is consistent with this being a response to vaccine-induced selective pressure. However, both human and animal data indicate that Prn loss does not worsen disease, and shows that the pertussis vaccine is still the best broadly available protection from whooping cough. The long-term solution to the problem of the bacterium slowly evolving around the immunity induced by the vaccine is a new, more broadly-acting vaccine. And, as I’ve discussed before, there are several whole cell variants in various stages of testing being reported in the literature. In the short-term, people should get their adult boosters and protect themselves from pertussis disease. I got mine last year, making sure to ask for the five-component variant (Adacel in Australia), in the hope of that extra protection. It’s quite clear now that there’s a problem, with the whooping cough bacterium gradually accruing mutations which should afford it some protection from immunity induced by the vaccine. I hope in the coming months we will see some sensible action by the Australian Technical Advisory Group on Immunisation, as I don’t want to see what the national pertussis statistics may look like in a decade if this problem is not addressed soon. One of Meryl Dorey’s trump whines has always been the cry that she has been the target of death threats and threats of harm from people who are real people. That being the case I wanted to point to some real threats of death and harm, made by real, traceable people: people who were incited to make their threats by Meryl Dorey and the Australian Vaccination Network. On February 10 2012, Dorey published a blog post titled SAVN’s Trouble With The Truth. The post is basically Dorey having a moan about being contacted to substantiate many of her claims and lies. She used the title as a direct rebuke to Ken McLeod’s three-part series of facts, Meryl Dorey’s Trouble with the Truth, to which Dorey has never responded to clear up her conga-line of anomalous claims, despite many requests to do so. ‘Vaccine resistant’ pertussis – in a way, yes. In a more accurate way, no. This post is a discussion of the February 2013 report from Philadelphia that the pertussis bacterium may be losing expression of the vaccine target protein pertactin, and the implications of such a loss. A discussion of the April 2014 paper that found most Australian pertussis bacteria have lost pertactin expression can be found here. A recent letter to the New England Journal of Medicine is making the news rounds online. With the title Pertactin-negative variants of Bordetella pertussis in the United States (full text here) it describes the findings that some of the whooping cough bacteria (Bordetella pertussis) in the US appear to have stopped expressing one of the proteins targeted by the vaccine. With headlines like “Whooping cough may be becoming resistant to vaccines” and “Some Whooping Cough Strains Now Outsmarting Vaccine” circulating in response to the report, it is important we seriously consider the results’ implications when it comes to efficacy of the pertussis vaccine. Firstly, what do the findings even say? Well, first we need to understand the current pertussis vaccines. Back in the 1940s a pertussis vaccine was introduced that contained whole killed bacteria (a whole cell pertussis vaccine, or ‘wP’ for short). This had a dramatic effect on incidence of disease and associated deaths. However, as the disease declined, the more serious side effects of this vaccine (febrile seizures, dizziness and fainting) became more of a concern, and uptake of the vaccine dropped, leading to a resurgence of disease. In response to this, vaccines were developed with fewer pertussis components – less bacterial content meant less general reactions, a cleaner vaccine all around. These new shots that contain a handful of proteins rather than a whole cell are referred to as acellular pertussis (aP) vaccines. The currently available aP vaccines in the US and Australia contain either three or five pertussis components (they also always come with diphtheria and tetanus toxoids, and are sometimes also combined with polio, hepatitis B ad Hib vaccines). Three pertussis proteins are in all aP-containing vaccines – PtxA, Prn and Fha. PtxA is the active subunit of the pertussis toxin (though it is inactivated for the vaccine). The majority of the disease caused by B. pertussis is caused by the toxin, so the presence of anti-toxin antibodies before infection is a prime goal of this vaccine. Prn and Fha (short for pertactin and filamentous haemagglutinin [see why I’m using abbreviations?]) are adhesion molecules. In order for pertussis to infect a human it must latch on to our respiratory tract, and that is exactly what these proteins are for. The other two proteins included in only some vaccines (two types of fimbriae – Fim for short) are adhesion molecules too. Okay, that’s probably enough background, you get it, aP vaccines target the pertussis toxin and either two or four adhesion molecules. Because most aP-containing vaccines (4 of 7 and 5 of 7 brand names in the US and Australia, respectively) have just the three proteins, I’ll discuss the recent results at relevant to immunity induced by these three-component aP shots. The researchers who wrote the letter in question analysed pertussis bacteria from 12 children hospitalised with the infection in Philadelphia in 2011-2012. They found that of these twelve pertussis isolates, only one had Prn protein. Yet, by the standard test, all of these bacteria would have been considered positive for it. You see, the protein can vary between individual bacteria, with the variations in pertactin being numbered, Prn1, Prn2, Prn3, etc. The way the specific variation is normally tested for is that the variable part of the gene is sequenced, allowing researchers to categorise the specific Prn-type the isolate is carrying. The researchers found mutations outside of the variable region that rendered the gene unable to produce Prn protein. As such, although all twelve isolates registered as having Prn type 2 by the standard DNA-based test, eleven were negative for the actual protein, something that only DNA sequencing of the whole gene revealed. Not only does this raise the problem of vaccine evasion (less proteins targeted by the vaccine should hypothetically equate to less protection), Prn-negative mutants are not new, but this raises the possibility that Prn-negative mutants could have been circulating for longer than we think, undetected by the standard Prn-classifying technique. The fact of the matter is that these are just the results from twelve clinical isolates. All eleven of the Prn-negative strains were otherwise Prn2, so one could naively generalise to the whole country (Prn2 is the predominant type in both the US and Australia). However, the researchers identified three different mutations that caused Prn-negativity in their letter, so rather than being one pertussis type that lost Prn expression and then became the predominant one, it looks like Prn-negativity has cropped up independently multiple times in the already prevalent Prn type 2 variant. We don’t know the true prevalence of Prn-negative strains, or how long they’ve been around, however I doubt it will be long before we do. Take for example, this study from mid last year. The authors took 661 different pertussis isolates collected in the US from 1935 (before the pertussis vaccine) to 2009, stored by the CDC, and analysed their genomes for a number of different measures of diversity, including typing the proteins targeted by the vaccine, to see how selective pressure from the various vaccines through the years may have affected the wild pertussis populations throughout the country. It would be the work of a few months for the researchers to re-culture the bacteria and test for the mutations that stop Prn expression – possibly only weeks should they have kept the DNA samples produced during the study. I would be fascinated to see how recently these variants emerged, and whether this emergence correlated with any particular change to the vaccines or vaccine schedule – information that could lead to smarter vaccine design. Okay, so we don’t know how prevalent these strains are, but let’s assume the worst, that all wild B. pertussis populations have lost expression of pertactin. How would that influence vaccine-induced immunity? Well, the current best efficacy estimates of 3-component aP-vaccine induced immunity, as established by the Cochrane Collaboration, is 84-85%. You may have seen some news early last year stating a new strain was evading vaccine-induced immunity thanks to a mismatch in pertactin. There is a meme in the scientific literature that pertactin induces ‘type-specific’ antibodies; that is, antibodies induced by type 1 pertactin in the vaccine don’t bind the Prn2 most wild strains carry. As I discussed in more detail here, this is incorrect, a study on human Prn immunity from 2008 shows most anti-Prn antibodies bind parts of the protein that don’t change between types, meaning that result should have little to no influence on this estimate of vaccine efficacy. Okay, so what might the efficacy of aP shots be reduced to? Well, the loss of Prn expression effectively reduces three-component aP vaccines to two component vaccines that only target PtxA and Fha. And it just so happens that the Cochrane Collaboration also covered the efficacy of such two component vaccines, with the two studies that met their rigorous inclusion criteria reporting efficacy rates of 59% and 69%. Okay, that’s a pretty big drop – 84% down to 59-69%, but what do the numbers mean in real terms? I have a real qualm with the standard ‘vaccine effectiveness’ measurement, as it presents the available data in a rather obtuse way which, although no doubt second nature for statisticians, is rather inaccessible for everyone else. The measure is calculated by comparing the percentage of vaccinated in the study that get the disease and the percentage of unvaccinated in the study that get the disease, with 0% efficacy representing an identical rate of disease in both the vaccine-recipient and non-recipient groups (which of course means the vaccine does nothing) and 100% representing complete protection of the vaccinated, but not the unvaccinated. The formula can easily be re-arranged to give the relative frequency at which the unvaccinated catch the disease compared to the vaccinated. An 84% vaccine efficacy equates to a 6.25x greater rate of pertussis disease in those who did not receive the vaccine compared to those who did not. This contrasts with 59% and 69%, which equate to a 2.4x and 3.2x greater rate of pertussis in controls who did not receive an aP-containing vaccine. So, in real-world terms, this is clearly a significant decrease. However, it is just as obviously the case that it’s far better to have received the vaccine than not, with a 2.4-3.2 times greater disease rate in the unvaccinated kids. Okay, so that’s the worst case scenario, but there’s still a few unknowns. Firstly, we simply don’t know how prevalent these Prn-negative strains are (though, like I said above, I imagine that question will be answered soon). Secondly, we don’t know what disadvantage the bug is at by losing pertactin. I said above that Prn is an adhesion molecule, with adhesion being critical to causing disease. As you might imagine, in a mouse model of pertussis infection, losing Prn expression led to a statistically significant decrease in the amount of pertussis bacteria in the lungs and trachea of infected animals, so it’s possible this reduced vaccine efficacy will be mitigated slightly by the reduced colonisation efficiency of these mutants. However, for all the speculations unknowns are still unknowns, and only continued research will change that. What about vaccine designers? Well, the obvious solution is to include more pertussis proteins in the shot. Work into which pertussis proteins elicit an immune response is done, just take this sort of study, in which mice are immunised with wP or infected with live pertussis. The antibodies from these mice are taken, and their target proteins identified as a way of finding the pertussis surface proteins that best elicit an antibody response. Rather than adding a few surface proteins here or there, what might be better is adding the rest of the cell. Yes, the initial wP vaccines had those mentioned side effects, but as you might imagine, research into better whole cell vaccines has continued into the aP era. Take for example, this phase III clinical trial of a whole-cell pertussis vaccine with reduced side effects. Or this live-attenuated B. pertussis strain, though only just past the first phase of clinical trials. In the long run, the solution will no doubt be a better pertussis vaccine, and the current research is all incredibly promising, with multiple options coming up in the medium to long term. However, more immediately, the first thing will be for other researchers to see if these same results can be seen in other pertussis isolates throughout the country, and throughout the world. However, even in the worst case scenario for the implications of these results, the vaccine is still effective, and as safe as ever. So get your boosters, the same as you ever would, and just keep an ear out over the next few months as this story evolves, right alongside pertussis. In America the 5-component aP vaccines include Daptacel, Pentacel and Adacel; the three component aP vaccines being Infanrix, Kinrix, Pediarix and Boostrix. In Australia the 5-component aP vaccines are Adacel and Adacel Polio; the three component vaccines are Infanrix-Hexa, Infanrix-IPV, Infanrix-Penta, Boostrix and Boostrix IPV. For what it’s worth, all the brand names of the 5-component vaccines are registered (?) trademarks of Sanofi Pasteur, the 3-components of GlaxoSmithKline.